Having fun with a kaput monitor · Nifty tidbits! Couple of weeks ago my ancient 10 year old Viewsonic 19" LCD monitor started going bonkers…​ Wouldn’t switch on properly - the standby light would just blink. 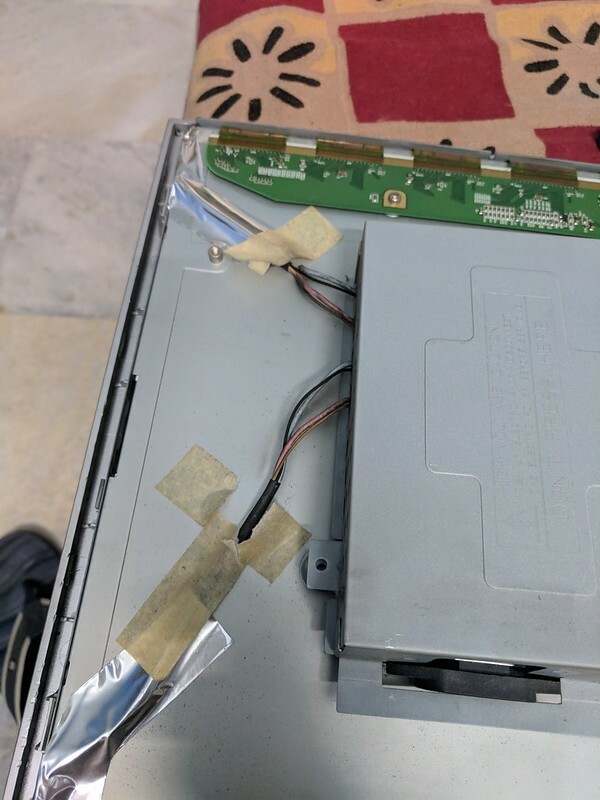 Initially I suspected a contact problem and re attaching the cables seemed to do the trick - the monitor would come up and it would be fine until I swtiched off again. It seemed to be an intermittent problem so not much I could do besides do. Over the course of the week the problem went from bad to worse till eventually it just wouldn’t come up and re-attaching cables wasn’t helping. Interestingly, if I let the monitor on, it would blink for about 10 mins and then eventually switch on - that pointed to some component inside having become weak. In any case, I ordered a new monitor off Amazon - it was time to upgrade anyway to a 1080p panel and this seemed to be a good enough reason. While the new one was being shipped, I thought it would be good fun to try and fix the Viewsonic. Now, I know next to nothing of electronics/hardware - so this was going to be a first and I didn’t actually expect anything to come out of it. First step was to Google and the overwhelming majority of links note that the sort of problem above is usually due to elecrolytic capacitors becoming weak over time. A couple of youtube videos on how to identify blown caps etc later, I felt confident enough to start. Getting the monitor back panel off though was a pain - as usual, these are made of plastic and while a spudger helps to force the plastic clamps open, it did end in quite a few broken clamps.. Well - can’t help it…​ Eventually I was able to get the back plastic cover out and then got to the board. A quick look confirmed that most of the capacitors were blown/leaky. Soldered off the capacitors off the board and then a trip to SP Road and I got a set of replacement caps for about Rs 60 (bought double of each since I was pretty sure I’d mess something up). Dad is a lot more handy with electronics and told me to tin the leads off the caps prior to soldering them on the board. Soldered the new caps back in place [burning myself just once during the entire exercise, which is quite an achievement]. The moment of truth now - stuck the board back to the panel, connected a VGA cable from my laptop and powered the monitor on - AND, LO & BEHOLD - IT WORKED!